There are good reasons why developers generally steer clear of ‘tricky’ sites. Potentially exorbitant groundwork costs, coupled with prolonged periods of uncertainty, can rapidly transform a viable project into a daring gamble. However, what might appear to be a ‘problem plot’ can sometimes turn out to be a blessing in disguise for self builders willing to take on technical challenges. The primary role of foundations is to anchor the building to good bearing ground (in other words, ground capable of supporting the building). Even relatively lightweight structures, such as timber frame houses, need to be securely ‘fixed in place’ to resist ground movement. The trouble is, conventional trench foundations start to become uneconomic below about 2m deep. So on sites where stable ground is in short supply, you’re likely to need something a bit more sophisticated to protect your home from the ravages of nature. This normally means consulting a structural engineer at the design stage. 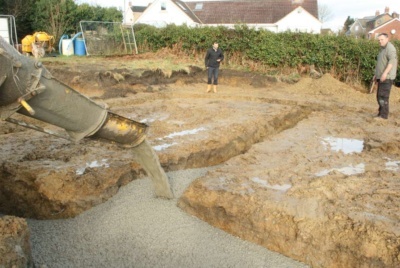 The need for ‘special’ foundations can also extend the time taken for groundworks from three or four days for a conventional build, to perhaps two or three weeks — more than doubling your total costs for this stage of the project. 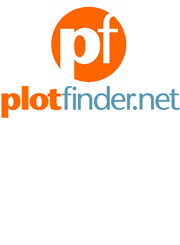 What Constitutes a Tricky Plot? The three main causes of escalating groundworks are sloping sites, the close proximity and/or presence of trees, and ‘bad ground’. Even quite shallow slopes can pose complications. Designing the drainage and access will need careful attention, and surface water coming down the hill will need to be channelled around the building. As a rule, the steeper the site the greater the cost, with expensive retaining walls often required on gradients of more than 1:25, to hold back the ground. The biggest decision, however, is where to position the building. One option is to build into the hill, excavating to create a level base. 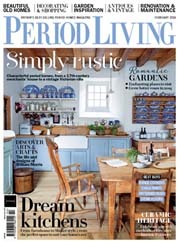 Alternatively you might decide to extend the building outwards with supporting walls constructed under the raised area. Both options are likely to add upwards of £5,000 to your groundwork costs. 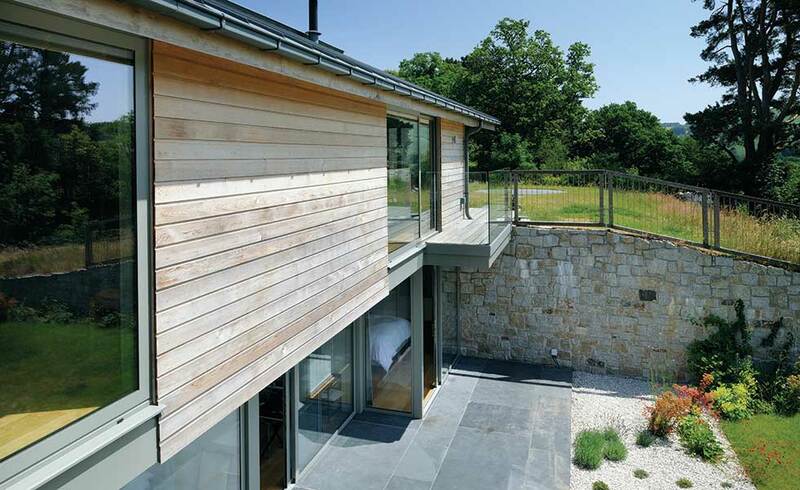 The compromise method is to fit the house to the slope with a series of steps creating a split-level layout. This will reduce the amount of excavation, although it can still add as much as 10 per cent to your overall build cost. However, sloping sites can provide an opportunity for adding extra space by incorporating a basement as a cost-effective way to fill the void when building out above ground level. Retaining mature trees can add a lot to the ‘amenity value’ of a property, while helping to mollify planners and disgruntled neighbours. The problem is, notoriously thirsty species such as willows and poplars can cause ground instability in subsoils such as shrinkable clay. 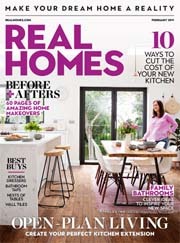 As a rough guide, it is recommended that buildings on conventional foundations should not be closer to single trees than the height of the tree at maturity, or one-and-a-half times for groups of trees; the National House Building Council (NHBC) publishes tables showing ‘safe distances’. To determine foundation depths, you also need to consider the shrinkability of the subsoil and the water demand of the species, as well as noting the distance of trees from foundations. Cutting down trees can also cause problems. For several years following the clearing of a site, clay soils can gradually expand, absorbing the moisture no longer taken by the trees. The foundation design needs to allow for this. 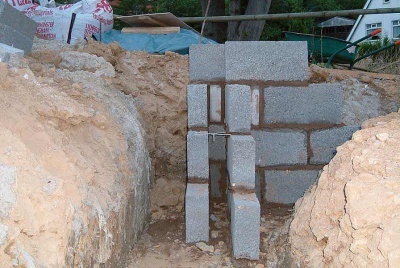 Root barriers can be a useful method of protecting foundations. This involves excavating a narrow trench between the tree and the building about a metre deeper than the lowest roots (trenches are typically about 4m deep) into which large rigid plastic sheets about 4mm thick are inserted. Volume change: Shrinkable clays suffer seasonal volume changes, although this rarely extends more than a metre below the surface. Problems are exacerbated by trees and shrubs in close proximity, combined with periods of drought and heavy rainfall. Frost heave: Springy or boggy ground is indicative of a high water table where soil can expand when frozen. However, surface groundwater rarely freezes at depths of more than half a metre. Made up ground: Previously developed ‘brownfield’ land can contain all manner of horrors, such as old footings, drains and wells. Former industrial uses or dumps may also harbour potential risks with toxic chemicals or methane gas, so it’s advisable to consult local authority registers of contaminated land. In some cases, however, the solution can be relatively simple such as specifying sulphur-resistant cement. Unstable ground: Worst of all, past excavation or mining activity may have made the ground highly unstable, with new foundations potentially subject to periodic, unpredictable subsidence. On ground with poor bearing capacity, such as soft sandy clays, the simplest solution is to dig down a little further. 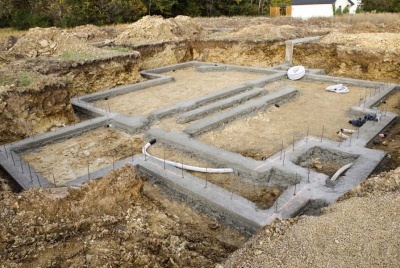 If a standard trench foundation is deep enough, its base should be supported on firm ground unaffected by seasonal changes, while beam and block floors can happily bridge across the surface. In clay areas, however, the ground around the sides of the foundations will still be prone to periodic expansion and contraction as the ground becomes saturated and then dries. So to resist lateral pressure, the sides of the trenches can be lined with a flexible slip membrane which allows the clay alongside to independently shrink or swell. Also, building wider foundations can help spread the load over a larger area, but this may require steel reinforcement to prevent shearing. And, as we have seen, with deeper trench foundations it soon becomes cheaper, easier and safer to switch to one of the following ‘engineered’ solutions. 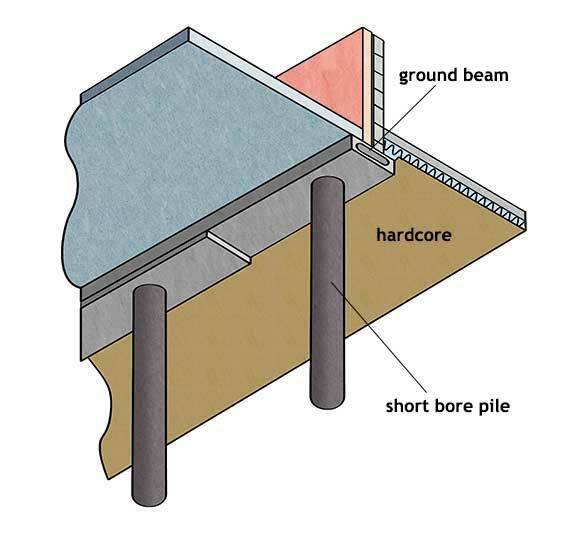 Piles are concrete columns drilled deep into hard bedrock to securely anchor the building, aided by frictional resistance from the surrounding ground. 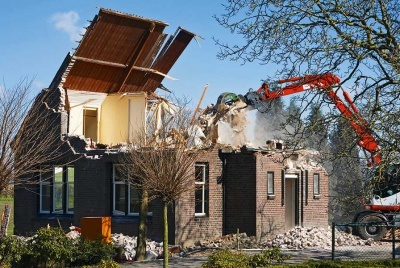 This method has become much more common in housebuilding since the advent of cheaper short-bored systems installed using hired mini-piling rigs. It’s now the most widely used foundation type after conventional trenches, thanks in no small measure to planning requirements encouraging retention of trees and the development of brownfield land. Augered piling is widely used in clay subsoil and involves drilling holes (200mm to 600mm in diameter) as deep as 24m with an ‘auger’ (a rotating shaft with cutting blades). Once drilled, the auger is withdrawn and the hole filled with steel-reinforced concrete. This is the least expensive and most common method, and is virtually vibration free. On sites with very restricted access, lightweight hand auger tripods can drill with a diameter of up to 300mm and to a depth of 13m. Continuous flight auger (CFA) piles are used in unstable or water-bearing ground. The main difference from augered piling is that the drilling pieces are hollow so concrete can be pumped directly to the bottom of the hole as the auger is withdrawn. Driven piles use a steel casing and are suitable for wet, unstable or contaminated ground. More economical than the CFA method, these piles come in sizes varying from 150mm to 320mm. The casing is first placed in a small pilot hole and then pushed into the ground using a suitable weight on a hydraulic pile driver. One benefit of this method is that it creates little or no spoil, saving on transport and disposal, thus also reducing the carbon footprint. Screw piles (also known as helical piles) are akin to giant wood screws — these hollow tubular steel piles are wound into the ground by machine with no prior excavation. The main benefit is fast installation and minimal soil displacement and disposal. 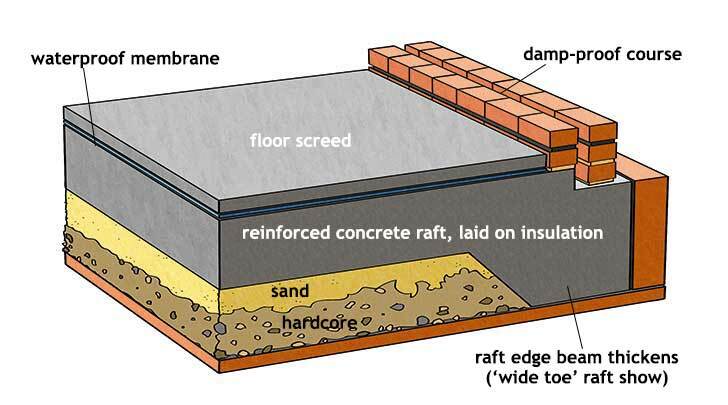 A raft is a large continuous reinforced concrete slab that extends under the whole building. By distributing the load over the entire footprint, the load per unit area is reduced, making a raft suitable where there’s ground instability, such as sites with a history of mining. 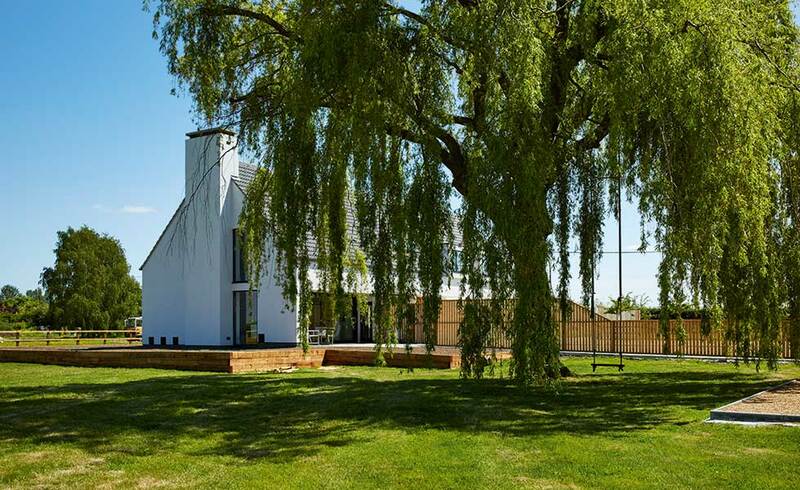 Rather than trying to anchor the building, in the event of subsidence the raft is designed to absorb the movement, protecting the structure of the building sitting on top. Because rafts can bridge across weak areas, they’re also often used on compressible backfill land, sites with groundwater or clay prone to excessive shrinkage, and areas with unpredictable geological conditions such as streams flowing deep below the surface. Conventional ‘flat rafts’ comprise a slab of uniform thickness with a mass of steel reinforcement top and bottom to provide resistance against both upward and downward bending. The alternative ‘wide toe’ design is used on ground with poor compressibility. Here the edges of the raft supporting the main walls are constructed thicker and deeper, and reinforced with metal ‘cages’. Construction is similar to a very thick solid concrete floor slab, but can either be cast directly into the ground or ‘floating’ on a bed of fine granular material. Rafts also need to accommodate possible ground movement without fracturing service pipes and drains which can be run through collars cast in the concrete. The main drawback of raft foundations is the high cost, largely due to the enormous amount of high-strength concrete and steel consumed. Pad foundations are designed to carry individual ‘point loads’. This type of foundation suits buildings with skeletal structures, such as steel frame or traditional post and beam, where the frame can be supported on a series of small concrete pads instead of the external wall sitting on continuous strips in the ground. 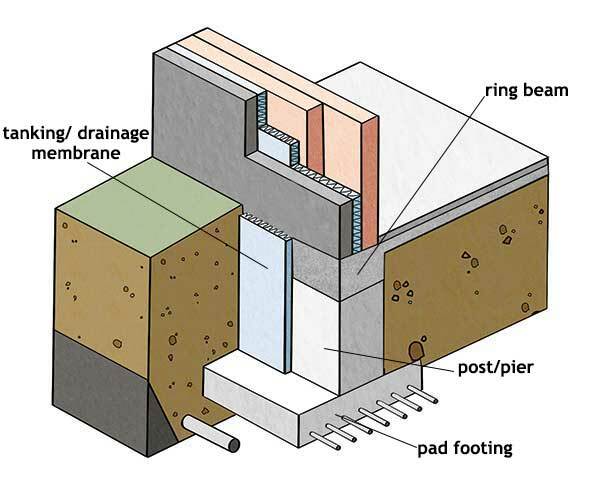 However, as with piled foundations, it’s possible to modify pads by constructing reinforced concrete ground beams that span between the concrete pads, making them suitable for supporting lightweight panel timber frame buildings. First a number of large holes are dug, about a metre deep. Typically these will be spaced quite close together at 600mm centres, and located at corners and under the more heavily loaded parts of the wall (for example, either side of window and door openings). Holes are normally dug by machine; a simple mechanical post hole borer can drill down to a depth of around 1.4m. Square or circular pads are cast individually in the bottom of each of the pits. Steel posts can then be bolted on top, or piers of brick or reinforced concrete built on to each pad foundation. One advantage of this system is that the construction process is within the capabilities of a competent self builder. Plus, it’s a reasonably eco-friendly foundation system as relatively small amounts of concrete are used. Pads can suit poor soils and can also be used to avoid problems where bored piling is sometimes obstructed by impenetrable pockets of rubble or hard gravel, snapping bits and jamming augurs. The downside is that the process is very labour-intensive. Piled foundations are normally the most economical solution for sites where loadbearing support is several metres below the surface, such as made up ground or shrinkable clay with deep-rooted vegetation. But where ground is unstable, a reinforced concrete raft that effectively ‘floats’ on the surface is a safer bet. The appropriate type of foundation will also be influenced by your chosen method of house construction. Conventional masonry walls are normally built on standard trench or raft foundations, since these readily provide a consistently level base. However, pile foundation systems with ring beams can also be suitable for both timber frame and traditional masonry walls. Pad foundations are suited to point loads from steel stanchions or post and beam walls. To prevent problems with damp and rot, traditional timber frame structures are probably best supported on short base walls built off ring beams. Modern panel timber frame structures are much lighter than those of masonry construction, so in theory should require less in the way of foundations. But as we have seen, what matters most isn’t so much the weight of house, but the fact that the load is bearing on firm ground that won’t move. As long as that box can be ticked, foundations shouldn’t be over-engineered for the loads they carry. Another factor with timber frame walls – or indeed anything that arrives on site prefabricated – is the need for foundations to have a greater degree of accuracy (plus or minus 5mm) since there’s less scope to make up for errors on site. 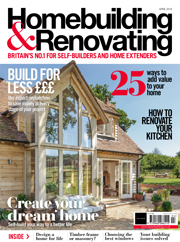 Should you Demolish and Replace?